Deer Hunter 2004 Game Review - Download and Play Free Version! Deer Hunter 2004 represents the most substantial upgrade to the series yet! Didn't manage to bag the big buck this hunting season? Deer Hunter 2004 gives you another chance...every time you play the game. 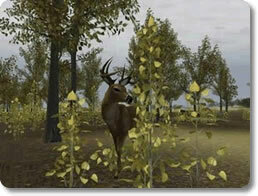 Deer Hunter 2004 is the latest hunting simulation preceeded by 5 other games in the series. 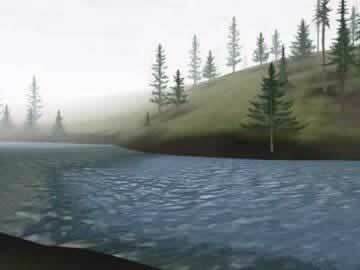 This latest version presents beautiful outdoor graphics and unparalleled realism. Realistic animal behaviors will keep the challenge high as you carefully track your trophy. Hunt with up to 16 other players via a LAN or online play. Form your own hunting parties and compete with your friends! Find 3 different species of deer: Whitetail, Blacktail, and Mule Deer. Customize your hunter with special hunting skills including tracking, stealth, weapons, calling and more! Deer Hunter 2004 is an extremely realistic hunting simulation game that is a good choice for players who love everything about hunting. You select where and when you want to hunt, as well as the weapons and gear you'll use. 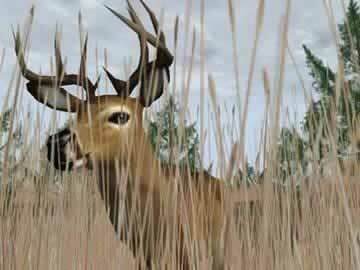 You can create your own hunter and improve your skills through bagging better deer. You can even take your skills online and compete against other players. This game has all the elements necessary to create an authentic and entertaining hunting experience. Before you can actually begin hunting in Deer Hunter 2004, you'll need to create a hunter. There are quite a few options available when it comes to customizing. You pick the name, select the look and clothing, and distribute points into various categories that improve your hunter abilities. You can change how well you fire weapons, hide your presence from the deer, track animals, and more. Once you've got a hunter, you can select a location to hunt and the gear you want to use. You'll begin your hunt in that area and can kill and collect (bag) up to three deer. You can bag one doe (adult female deer) and two bucks (adult male deer). Once you've got all three, your hunt is over and you can begin a new hunt. You can hunt alone, or go online and play with others. However, since Deer Hunter 2004 is an older game and Deer Hunter 2005 has been released, there really isn't anyone online to play. There are a total of six different locations where you can hunt ranging from the Kentucky farmlands to the Oregon Valley. While these are large and diverse maps to play, it would have been nice to have a few more options to choose from. When picking a location, you can also select one of three seasons, which will change how effective calls and lures can be. You can change the time of day and weather as well, all of which will affect the appearances and behavior of deer. For example, deer will often be found near water sources later in the day, or out in the open on sunny days. Not only can you hunt in these locations, but there's even an option to observe the deer in these locations with the Wildlife mode, which can give you valuable information for your hunts. There are three different difficulty levels offered in Deer Hunter 2004. These difficulties give you the ability to find a hunting experience that's right for you. One downside when it comes to difficulty and playing the game is just the amount of time you might need to hunt down and collect all these deer. You'll need a lot of patience to find the best deer or to camp out and lure them to you. The biggest problem for Deer Hunter 2004 is the total lack of any sort of tutorial or manual. When you first start the game, you're left to basically figure everything out on your own. This can be challenging, especially for people unfamiliar with hunting. While many items have simple descriptions that tell you what they do, they don't tell you how to properly use them. You might see that a certain scent attracts bucks, but no idea when or where to use it. A general hunting guide or tutorial of any kind would have been tremendously helpful. The presentation in Deer Hunter 2004 is one of the best parts of the game. The deer are detailed and realistic not only in their behavior, but in the way they look as well. The environments, while not as well done as the deer, are still authentic and detailed. The environments are quite large and filled with many kinds of plants and animals (not just deer). Overall, Deer Hunter 2004 would be an good game for anyone who has a strong interest in hunting. However, Deer Hunter 2005 is available for you to play as well. Deer Hunter 2005 is very similar to Deer Hunter 2004, but with many improvements (like more gear to use) and different locations to hunt. While this is still a fun game, it is less desirable as a result. If you enjoy hunting you can still give this game a try and see if it's right for you, but a better game might be available.